I sometimes receive polish from overseas for my Scottish friends because packages arriving in London can take an internal flight to reach them over the border. Sometimes the box is captured on the way to taking this flight and it has happened a little too often to chance it. Miss X often invites me to have a peep and play ... and this is what was inside the box! The box has five Australian brands and I think the brands included vary slightly each time. 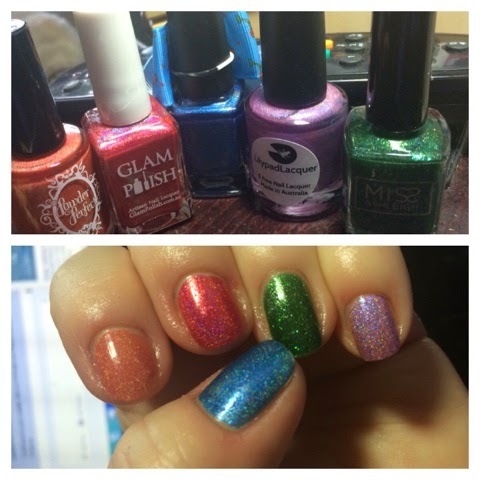 There are three holographic polishes, one shimmery sort of holo and one micro-glitter. All had fab application and dried reasonably quickly. The picture shows two coats with no top coat. Starting with my thumb, this is the Peita Polish. At first it reminded me of EP Marge's Blue Beehive. On reflection, I think it is lighter and is more like December 14. It has a medium strong holographic flame. My index finger has the Powder Perfect polish and it is a subdued orange with a subtle holo effect. It is a lovely polish to apply. Next we have a Glam Polish and it is an easy applying red holo with some red sparkles. On my ring finger is a lovely green micro-glittery sort of polish by Miss Ashleigh. It dries smoother than most micro glitters so I suspect it has something more to it. Perhaps it is a rich green jelly holding lots of tiny glitters. In the bottle, there are red sparkles showing, like red eyes glinting in a haunted forest. This doesn't really translate to the nail but there are a few red sparkles if you look closely. Finally, my little finger has Lilypad. This is a lilac with a mix of pink and purple shimmers. There is a slight sprinkle of holo. It is a pretty polish yet I feel it is neither one thing nor another. I'd prefer a stronger holo effect or none at all if I am honest. These mystery boxes are available from Peita's website and cost roughly £40 with postage from Australia included. The box is nice enough with five good quality polishes but perhaps there are simply too many good holographic polishes available these days. This is a general comment rather than a specific grumble at this one. I cannot imagine anyone being disappointed with opening this box. The next box for March 2015 has a Disney Princess theme and is available now from here.